Beautiful jewellery can be a wonderful way of�celebrating and remembering special people (or pets!) who touch our hearts. Local Mums recommend the best keepsake jewellery makers here. "I recommend�Moments Into Memories�to Local Mums. I am so pleased with my beautiful charm. which arrived today. I would recommend to anyone thinking of purchasing one. The work is beautiful and the customer service second to none. Thinking of getting another for my mum so going to start saving!" 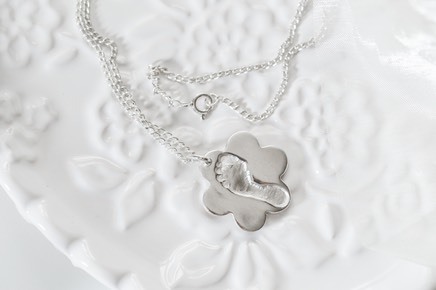 We create beautiful handmade jewellery using handprints, footprints, pawprints or drawings from your loved ones. Imagine having that first piece of artwork or writing forever encapsulated onto a piece of jewellery. We also offer bespoke and one off pieces of silver jewellery, designed to your requirements. Each piece is individual and unique, why not contact us and let us design something absolutely stunning for you to treasure forever.